Location of property -If a property is located in open woodland, or in rural areas that are exposed to much wind, this could result in gutters becoming blocked very quickly. Type of roof - Some roofs are prone to attracting moss. 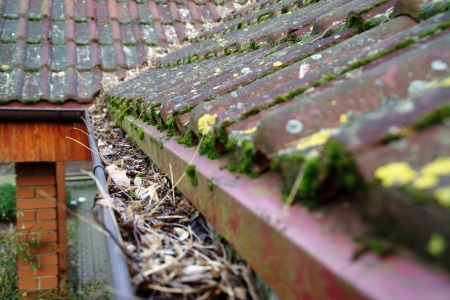 During rainfall the moss will be washed into the gutters and hence cause them to fill up very rapidly. Location of trees - Gutters that are near to, or are exposed to overhanging trees will easily become filled with leaves and hence the need for frequent cleaning. Pine needles can be particularly troublesome!! Rainwater spilling over the side of the gutters , especially during heavy rainfall, or evidence of damp on the exterior walls. When looking upwards, there may be grass or other forms of plant growth in the gutters that is visible from the ground. Clumps of moss on the ground near the building. Damp patches or mold on the bedroom wall, or other interior walls could indicate a problem. We cover many areas in Nottingham Derby, up to approx. 15 mile radius from Long Eaton (NG10). Allenton, Allstree, Alvaston, Arnold, Aspley, Aston-on-Trent, Attenborough, Barton-in-Fabis, Basford, Beeston, Bestwood, Bilborough, Borrowash, Bramcote, Breaston, Broxtowe, Bulwell, Carlton, Castle Donnington, Chaddesden, Chellaston, Chilwell, Clifton, Colwick, Derby, Diseworth, Draycott, Edwalton, Elvaston, Gamston. Gedling, Gotham, Heanor, Hemington, Horsley Woodhouse, Ilkeston, Isley Walton, Kegworth, Keyworth, Kirk Hallam, Lenton, Littleover, Lockington, Long Eaton, Mapperley, Markeaton, Mickleover, Netherfield, Newthorpe, Nottingham, Nuthall, Oakwood, Ockbrook, Risley, Ruddington, Sandiacre, Shardlow, Shelton Lock, Sherwood, Sinfin, Spondon, Stapleford, Stenson, Stenson Fields, Strelley, Sutton Bonnigton, Top Valley, Toton, Trowell, Watnall, West Bridgford, Weston-on-Trent, Wilson, Wollaton. How much should I pay for Gutter Cleaning? Gutter Cleaning prices in Nottingham, Derby Loughborough vary due to the size, height and type of property that is being cleaned. Also the type of equipment that is needed to carry out the task can affect the price. We try to keep our prices reasonable, most domestic properties fall anywhere between £40 - £100. Considering that the average house price is about £200,000 in the East Midlands, these prices are very modest to protect such a valuable investment.